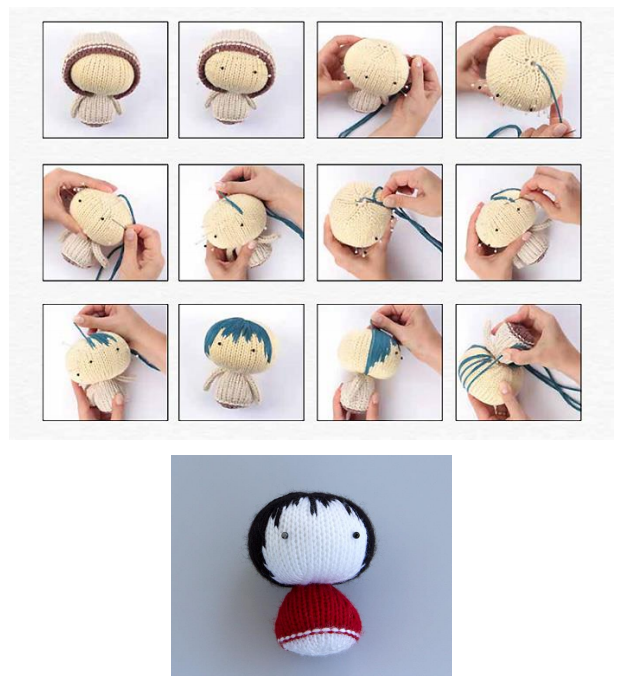 Do you like Taneshi dolls? We just love them. 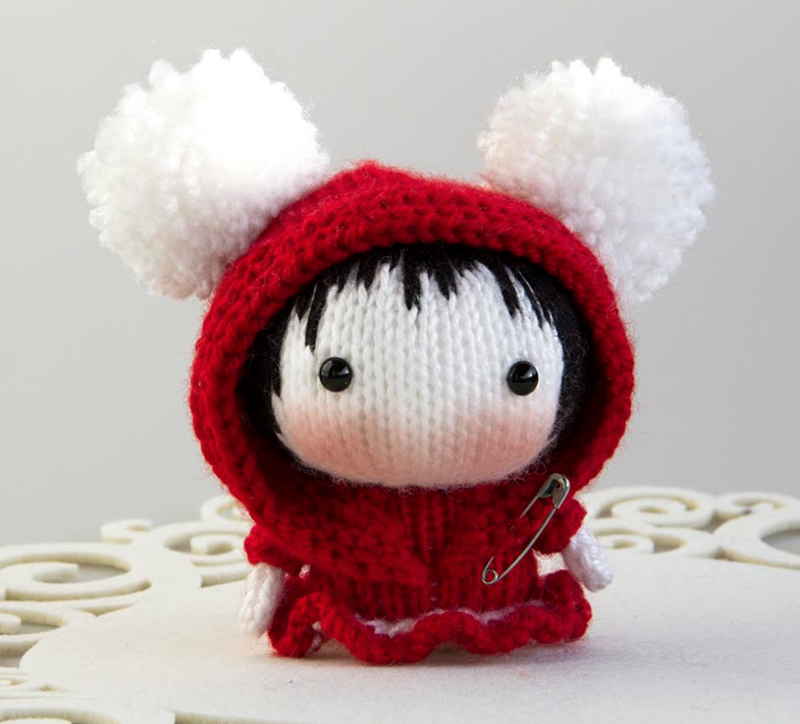 This lovely doll is a Mari Fet doll from Taneshi series and now you can knit it with this free and detailed pattern. This is basically for advanced beginner knitters. Toy related knit stitch. 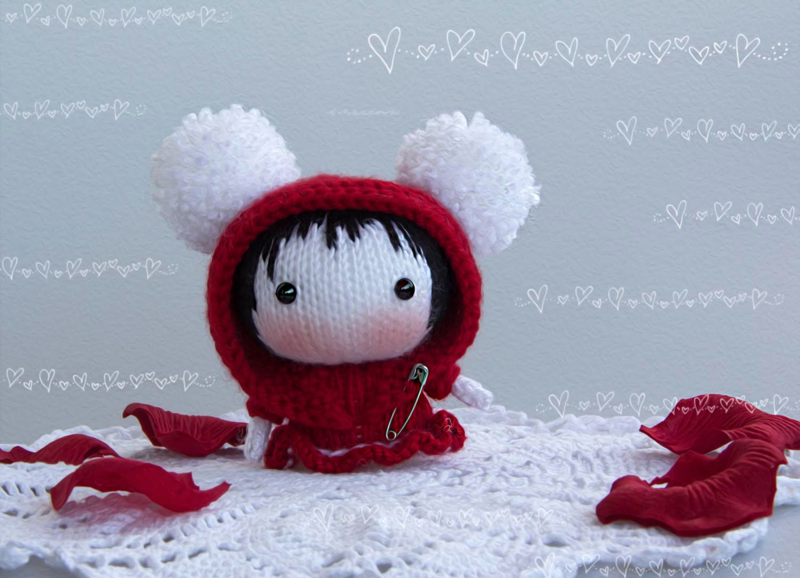 The finished lucky doll is approximately 5,12’’ / 13 cm / tall. 4 double-pointed needles in a size suitable for the yarn weight you are using. I recommend using needles a size or two smaller than the yarn calls for, to produce a firm fabric. I used needles size US 21⁄2 (3mm). 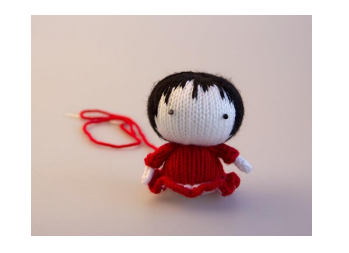 For an online tutorial of how I start knitting my toys using a crochet hook. 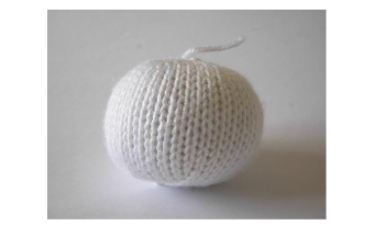 Knitted with white colored yarn. Needles size US 21⁄2 (3mm). Cut yarn and thread through six remaining sts (add more stuffing if required). 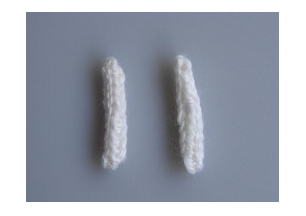 Start to knit with white yarn. 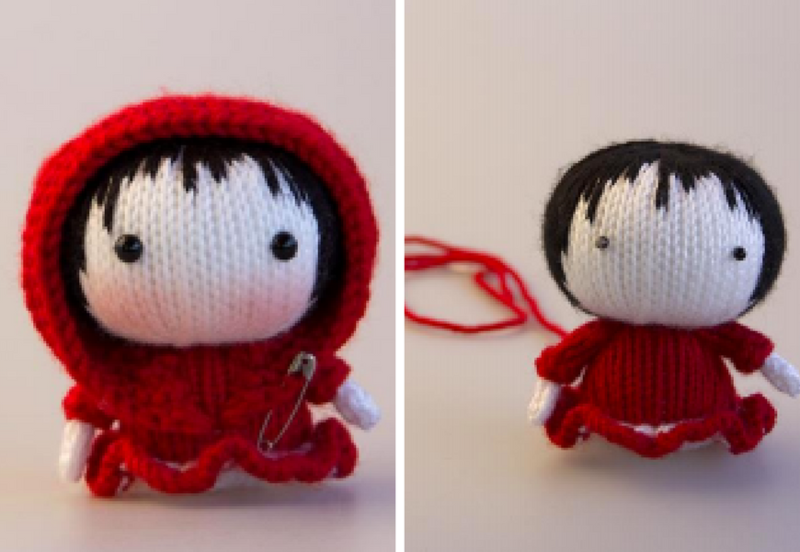 Change yarn over red color. Cut yarn and thread through remaining 6 sts (add more stuffing if required). Cast on 26 sts in purl bumps from rnd 5 of the body. 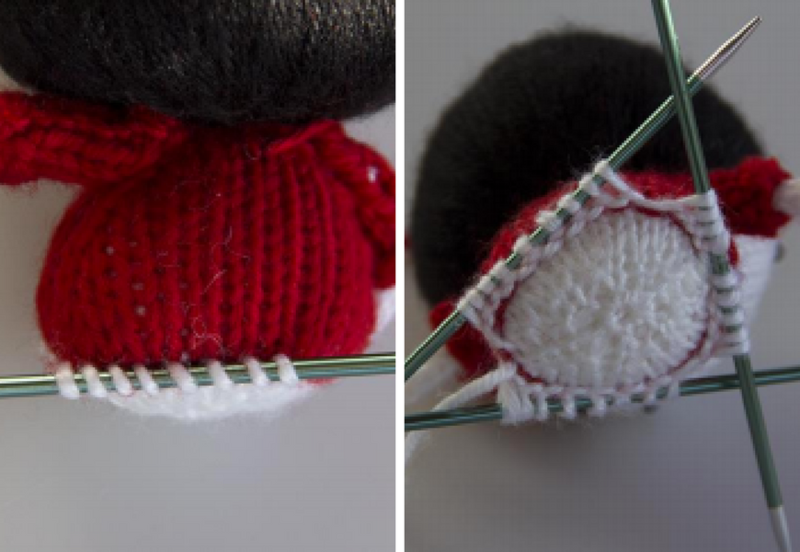 Knit in the round using white yarn. 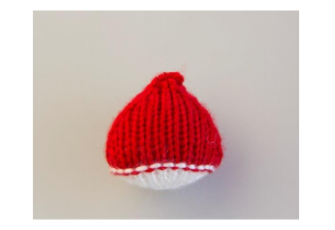 Knitted with red colored yarn. Now we starting knit flat. Turn your work to wrong side. Make 2 pieces. Knitted with white colored yarn. Cast on 3 stitches. Distribute among 3 needles and join to work in the round, being careful not to twist sts. Place marker. Or you can knit it as i-cord (it will be more easy). Do not stuff. 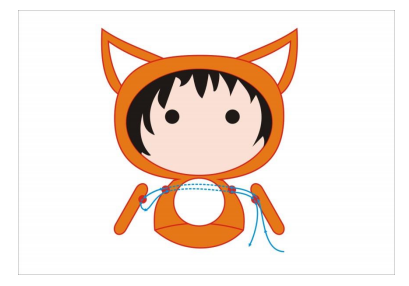 Cut yarn and thread through 3 remaining sts. Weave in ends. Make 2 pieces. 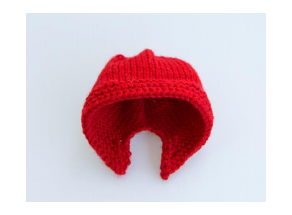 Knitted with red colored yarn. Cast on 5 stitches. Distribute among 3 needles and join to work in the round, being careful not to twist sts. Place marker. 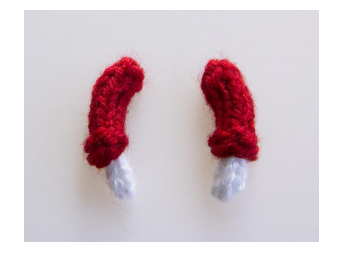 Or you can knit it as i-cord (it will be more easy). 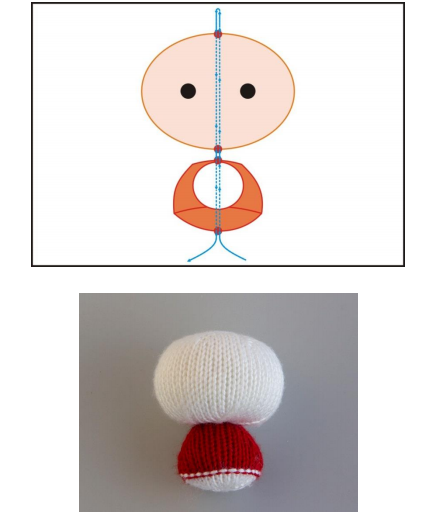 How I am finishing dolls: Fixing head and body. Use a long needle with a yard of strong thread, doubled and knotted at the end. Start at the underside of the body. Push the needle thru to the outside of the torso. Push the needle thru the head and out on the opposite side. Go back thru to the inside of the head taking a small stitch on the outside. Repeat this procedure thru the head and body gently pulling the thread to tighten the joint with each pass thru, one or two more times, but do not indent too deeply. End on the underside of the body. Bury the thread into the body. Now put arms into the sleeves. I used crotchet hook for this. How I am fixing arms: Sew arms through the body. With doubled thread, start at the underside of one of the limbs, leaving a five or six inch long tail and push the needle thru to the outside of the limb. Go back thru to the inside of the limb taking a small stitch on the outside. Push the needle thru the body and out on the opposite side. Go thru the other limb from the inside to the outside. Taking a small stitch, go back thru the limb to the inside, back thru the body and thru to the outside of the first limb. Repeat this procedure thru the limbs and body gently pulling the thread to tighten the joint with each pass thru, one or two more times, but do not indent too deeply. End on the inside between the body and the first limb. Tie off with the tail of the original thread. Sew the hood to the body. Glue the plastic eyes to the head. Apply red blush. Sew one or two pompoms to the hood.